Adventure games can fall, most commonly, to three major problems. The visuals and audio of such games, honestly, don’t matter much; while it’s nice to have a pretty game like Myst to play around with, some of the best games in the genre, like Zork and, more recently, Shade, are purely text-based and get along just fine. For an adventure game to be “great”Â, it generally needs three elements: first, it must have a plot that’s good enough to make you feel the need to spend hours picking away at various puzzles just to see more of it, second, it must have puzzles that don’t put the player off so much that they stop caring about the plot, and finally, it must give the player a reason to come back to the game so they don’t just finish the game in one shot and move on with their day. Most of the better adventure games on the market generally nail the first two elements just fine, though the third is often neglected, sadly, but if your game can’t nail the first two elements properly, forget it. The DS has given the genre a major renaissance in the past several years, with too many games to even begin counting, from the Ace Attorney series to the Touch Detective games to the Jake Hunter games and beyond that I could probably fill half a page just naming off games alone. This, unfortunately, is not to say that all of these games are, well, good, as while many of the games lack any sort of replay value, some don’t even do enough to convince the player to go through the game once. 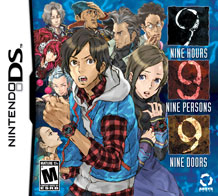 I mention all of this because 9 Hours 9 Persons 9 Doors is a rarity in the genre, and I feel I need to express this before we even get into reviewing the game itself. It is a rarity, you see, in that it manages to do all three things I’ve mentioned quite well, while also offering a solid presentation all around, and I wanted to express, before we went any further, that this was so before we get into why, exactly, this is. The story of what will henceforth be referred to as 999 is, honestly, pretty messed up. 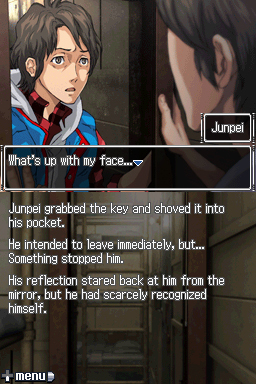 You play as Junpei, a college student who has woken up aboard a luxury ship after being abducted by a cloaked assailant identified only as “Zero”Â. On your wrist is a numbered display that you don’t understand, and in your head are a million questions you don’t have the answers to. After solving a tutorial puzzle and escaping from what would otherwise have ended up a watery grave, you meet up with a group of eight other people in the central hallway of the ship, where Zero fills you in on what’s going on. You’ve been drafted as a player in the “Nonary Game”Â, a game with life or death consequences. You have nine hours for your group of nine people to find your way through the ship, solve its puzzles, and escape through the door marked with a 9… or else you die. You’ll have to use the numbered bracelets to open numbered doors by evaluating your digital roots (add all of the numbers up until you’re left with one number), which is the only way to solve the mysteries of the ship and escape. Of course, nothing about this game is even remotely what it seems like, and the people you’re trapped on the boat with are hardly what one would call trustworthy, with the exception of your childhood friend Akane, who might well be the only person on the ship you CAN trust… maybe. The plot, in and of itself, is basically something out of the film Saw, to a point, though the motivations and actions of your jailer Zero don’t come off as quite so misguidedly altruistic as those of Jigsaw, and the Nonary Game is more structured and though provoking and less “inflict pain to make the person value life”Â oriented. As such, The Nonary Game comes off feeling like an actual game, run by a sick, sadistic individual, which, by itself, is a good enough concept to carry the plot along to its conclusion, whatever that might be. 999, however, isn’t content with simply being “good enough”, and the writing actually strives to make the experience feel like more than just a Japanese Saw derivative. The game is basically a visual novel with a bunch of puzzles and choices thrown in at various points, similar to something like Lux-Pain or Jake Hunter: Memories of the Past, but it manages to make its plot work in a way those games couldn’t quite manage. While Lux-Pain failed because of a bad, often cumbersome, translation, and Jake Hunter failed because the game doesn’t ask for much player investment, 999 is meticulously translated to a point where the dialogue is powerful and well written at all times, and the game asks for your investment in what’s going on through the generally outstanding writing. The characters don’t simply come across as characters so much as they come across as people, and as you progress through the ship with Junpei, you’ll begin to understand them as you would if you were in this sort of situation with these people. The dialogue and descriptions and expository text that pop up throughout the game never become overly problematic or boring, and the story is consistently compelling from start to finish as you discover more about the people you’re stuck on the ship with and the nature of the Nonary Game. A game based almost entirely off of its writing needs to be written well, and if it’s a foreign game, translated well also to really come across the way it’s supposed to, and because of that, there are a number of places such a game could fail along the way. 999 avoids this entirely, presenting a story that’s outstanding in concept and execution, and both Chunsoft and Aksys deserve a lot of praise for pulling this off as expertly as they did. 999 is also one of the very few games I can point at and say “I cried a little”Â, because the ending sequence is honestly powerful stuff. Of course, I can also say that I cried a little when Winnie the Pooh lamented the loss of his friends in Kingdom Hearts so I might not be the best person to compliment a game for this thing. Shut up. 999 is a pretty good looking game, due in large part to the outstanding artwork of Kinu Nishimura, best known for her various art pieces under Capcom, most obviously Street Fighter 3. Here, her artwork is well done, and brings the characters and the game world to life well, both the beautiful and the horrifying. The characters are all interesting and feature a decent amount of animation when talking, and the ship is interesting to look at regardless of where you might be in it. 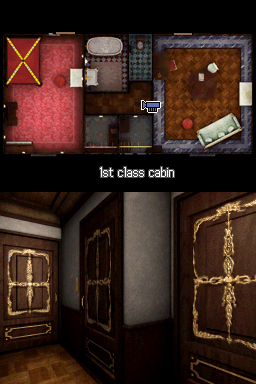 The game uses a decent amount of 3D as well when poking around in your inventory and solving puzzles, and it all looks pretty good for the DS. The audio is also very well done, and while not especially technically impressive, it works well enough. The game music is appropriately mysterious and matches the tone of the game, becoming frantic, somber, tense and more when the situation merits it. The sound effects are also fitting and match what they’re expected to match up to all in all. There’s no voice acting to the game, but considering the amount of dialogue in the game it’d likely be sporadic at best, and as such, isn’t missed. 999 has two play modes: Novel Mode and Escape Mode. In Novel Mode, the game basically takes over and tells the story, stopping every so often to let you choose things that may or may not influence the story. This is where the bulk of the plot takes place, as the characters discuss their predicament, what has brought them to this place, and who they are, all while trying to find a means to escape. Advancing the story is as simple as pressing A or tapping the screen, though you can also access your ship map, calculator, and files at any time during this mode, as well as save your game whenever you wish. Eventually, you’ll run into choices that come up, with some (identifying if you know something or not or choosing who to have test something with you) meaning nothing, while others (what doors to enter or who to offer aid to) having big consequences. These choices will change how the plot progresses, what you learn from the characters and so on as you go, and will influence how the game ends. Escape Mode is basically what it sounds like: you’re trapped in a location and asked to solve whatever puzzles are before you to progress forward. When an Escape Mode scene comes up, the game will display several different angles of the location you’re presently in, then inform you that you need to find a way out, at which point you’ll then be able to move the camera around as needed. Pressing left and right on the D-pad will allow you to cycle the view around through the environment as needed, though you can also do this by tapping on the arrows that appear on screen. Tapping anything of interest in the environment will allow you to interact with it, depending on what it is, so if you can travel to it, an arrow will appear allowing you to do so, while items you can use or pick up will be used or picked up as needed. By interacting with the various objects and environmental items, your companions in the room will interject and offer their own observations on whatever you’re looking at the moment, sometimes as plot exposition, sometimes as observations on the item, and sometimes as a way to hint at what you need to do to progress, depending on what you’re looking at. You can zoom out to see where in the room you might be at the moment if you need to get your bearings, and you can access a calculator, your files, and your inventory at any time at the press of a button, as well as save. Eventually, you’ll come across a puzzle, which will kick in a mini-game that will require you to solve the puzzle in order to proceed. The mini-games are all fairly well explained and diverse, as you’ll find yourself rearranging tiles in a picture to make the correct image, rotating a steering wheel to the directions on an itinerary, tapping out Morse Code messages, and converting numbers from hexadecimal to decimal… so I guess I’m getting SOMETHING out of my computer programming courses. Ahem. Anyway, the puzzles are, for the most part, completely sensible within the confines of the environment, and with one exception, I never had to look up the solutions to any of them, with the one exception being a sliding box puzzle, as I rather loathe those personally. The puzzles are quite complex, make no mistake about that, and you’ll spend a good amount of time puzzling over the solutions, but they’re all solvable through experimentation and general observation, and they’re all quite satisfying to complete. This wouldn’t be an adventure game if you weren’t asked to carry around inventory objects to solve puzzles, of course, but 999 handles this well enough, actually, as it never requires you to backtrack or carry around useless items. Everything you need to escape from a room is provided to you in that very room, and everything you can pick up is meaningful in some way. You can look over the items you’ve acquired in your inventory, and combine items you might feel are of interest to you as needed to try and solve the puzzles, though some combinations are more obvious than others. Regardless, you’ll be able to figure out the solutions to the puzzles, given enough time, as none of them are overly obtuse or convoluted, which is always a great thing to see in a game of this sort. Completing the game one time will take around six hours, depending on how long it takes you to solve the puzzles, and the odds are pretty good that you’ll end up with one of the bad endings. This is fine, mind you, as there are six in total to earn, each of which fills in more and more of the story of the characters and the events of the game. You’ll need to complete at least one of the bad endings in order to see the good ending, mind you, so you’ll need to play through the game at least twice. However, before you say “Wait, what?”Â and get annoyed, Chunsoft seems to have realized that no one wants to sit through the same dialogue over and over for hours, and has installed a way to avoid this thing. By holding right on the D-pad, you can skip over dialogue you’ve already seen until you get to a choice, an Escape Mode section, or a new segment of dialogue, allowing you to skip past hours of exposition in minutes. As such, completing the game a second time might well only take two or three hours, and further completions, even less time. I managed to unlock all six endings in around twenty hours, and to be honest, the time flew by. By the time I got to the final puzzle of the game, I was honestly surprised that the game was… over already, as the game is surprisingly involving, and you’ll almost want to keep going with the characters a little more just to find out anything else you might have missed, whatever little that might be. You can also go back and play through all of the Escape Mode rooms independent of the actual storyline if you just want to challenge yourself with the puzzles themselves, which is a nice touch. Of course, 999 isn’t a perfect game, unfortunately. This being a visual novel styled adventure game, anyone who isn’t a huge fan of lots of reading isn’t going to enjoy this game as much as they could because there’s a whole lot of reading to do as you play, good though the text itself may be. Also, while it’s nice that the game offers you the option to go through the Escame Mode at any time outside of the game, if you’re interested in unlocking all six of the endings, you’ll more than likely never take advantage of this. The problem here is that while you can skip past dialogue you’ve already seen, you CAN’T skip past Escape Mode rooms at all, so after the fifth time you’ve seen a particular puzzle you’ll be able to go to your grave with the ability to solve it. This is kind of diappointing, as I would have liked to have been able to go back to the game at some point to play through the puzzles again, but the odds of forgetting the solutions to the puzzles is somewhat on the low side. There are a few puzzles that will leave you spending time hunting around for a not terribly obvious item in the background as well, and while these are few, they pop up often enough to stop your progress dead as you try to hunt around for that ONE THING that will move the plot forward, which is an especially noticable issue during a puzzle that involves breaking dry ice, as you have to use ONE SPECIFIC THING when there are about FIFTY OTHER WAYS to accomplish this task. Again, this happens very little throughout the game, but when it does, you’ll notice. To be honest, though, 999 pretty much exists beyond its flaws. It is a fantastic game that is a worthwhile addition to anyone’s DS library, as it’s one of the rare examples of an adventure game that is a joy to play on nearly every level and more than justifies its asking price. The story is outstanding from beginning to end, featuring a well developed cast of characters and a plot that answers its questions in an interesting and satisfying fashion that makes you want to keep playing to the end. The visuals and audio are high quality for the DS, and the game is very simple to play and understand whether you’re progressing through the story or solving puzzles to make your escape. The fact that there are actually elements to the game that make it worth playing through more than one time also really helps the game a great deal, as so few adventure games really make the effort to give the player a reason to come back more than once. The game is heavy on the required reading, of course, and you’ll have to play through most of the puzzles in the game a few times to see the end, thus removing the point of a free puzzle mode. A few of the Escape Mode sections are frustrating as well because they require you to hunt down the one item you need to progress without giving you even the vaguest idea where it might be. The negatives in this case are far outweighed by the positives, however, and for anyone who loves a good story or adventure games in general, 999 is one of the best on the DS, if not overall, and is well worth the asking price, period. 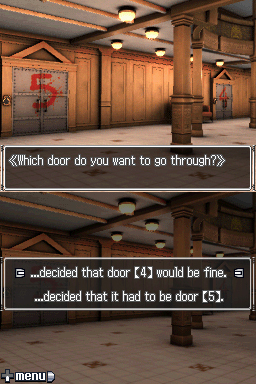 It’s sad that so few people are likely to play 9 Hours 9 Persons 9 Doors because it’s a niche genre game full of a lot of reading, as it’s really an exceptional piece of work that, despite the violence that pops up here and there, does a lot to prove how powerful gaming can be as a storytelling medium while also being an excellent product in its own right. The story is phenomenal, between the excellent characters, solid plot and excellent set pieces that occur through the story. The game looks and sounds nice all around and it’s easy enough to play that anyone could do so while providing enough challenge to keep more gifted gamers interested. There are six endings to earn as well and you can come back to play through the Escape Mode segments whenever you wish, which adds replay value to a game in a genre that’s not known for this thing in the least. 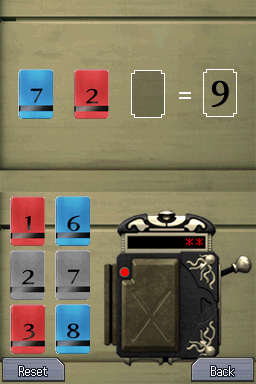 The game is going to be a hard sell for those who find reading to be an unenjoyable activity, of course, and between the frequent repetition of the Escape Mode rooms to earn all of the endings and the fact that a few rooms are frustrating enough to frustrate at times, 999 isn’t going to be for everyone. Which is really a shame, as it’s one of the best adventure games on the DS, if not overall, and it’s a shame that more people won’t play it, as it really does deserve to be played. Love this game, glad I imported it. It’s time though for a more positive ending. I’ve done 4 runs so far, got 3 different endings, all of them messed up. One ending I gave me the ending credits and didn’t say bad ending. I wonder what that was all about. Well, I’m working on putting together a guide for the game to get all six endings and help with the puzzles, so that might help. 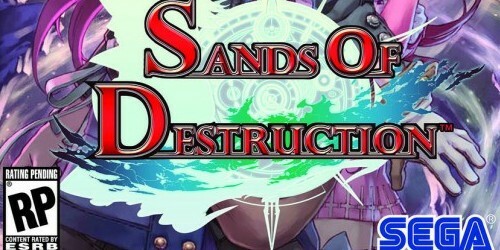 The ending you got with no “BAD END” text… I think that might have been Axe? I remember one of them not saying anything and for some reason I think of that one. Bought this based off of the saw comparison, the fact that it was an adventure game on the DS, and based on your score. I actually read the whole review afterward. I’m certainly enjoying myself, but my score would be probably a bit lower though not much. Pretty awesome game though. I thank you for reviewing it, because I hadn’t even heard of it until I saw this. No it’s was not the axe. The icon I got for the end credits was a submarine. I also have the axe it said ‘bad ending’. A guide might help although I want to try to find this stuff out on my own first. I don’t have much experience with visual novels aside from Snatcher and Policenauts but these titles are much more linear. These games require trying every option available till something triggers a cut-scene. With this game I wonder what triggers certain events. For example, in one run Lotus sits behind a computer going on about caveman and computers. In a later run she’s about to do the same thing but got pissed off and tells me to take a hike. I can’t recall doing that much different before I got to that point. But I’m not bored of the game yet. I’ll figure that stuff out eventually and get a more positive ending… I hope. Aaron – I attributed it to the desire of people to try to normalize traumatic situations. Like, when you go to a funeral, and people make jokes to try and lighten the mood and such? Same thing. I figured it was a coping mechanism, and honestly, reading nothing but the characters losing their heads for the whole game would have come off kind of… I don’t know. Repetitive, I suppose. But I can understand that, and so long as you’re enjoying it either way, rock out. Hellyeahz – Was it the submarine ending that had no “bad end”? Huh. Most of the visual novels I’ve played have generally been more linear as well. See Jake Hunter and Lux-Pain for instance. I was honestly glad that this game didn’t force you down one path, but rather gave you different options on how to do things as you saw fit. If I understand it right, the flag for the event you mentioned is whether you go through Door 4 or Door 5 in the beginning; by going through Door 5, for whatever reason, that scene plays, whereas if you go through Door 4, it doesn’t. Well, in the meantime, if you have any questions, feel free to drop me a line here or through E-mail or what have you. I’ve cleared out the whole game so I’m happy to help. The one I can guarantee had no bad ending is Ending 4. Charlene – Ending 1 doesn’t have a bad ending attached either, though that’s for different reasons. Ending 2 says “To Be Continued”, also. And please don’t post major spoilers in the review comments, thanks.